Sometimes minor cracks in the foundation walls that are leaking can be fixed with epoxy crack injection. We install sump pumps to help flush the water out of your basement and away from your home. Waterproofing a crawlspace is defined as the resistance of the passage of water under hydrostatic pressure (ground water) through the foundation and accumulating in the crawlspace. This process is usually applied with the construction of a home by installing gutters, the proper sloping of soil, waterproofing membrane or sealant on foundation wall, downspout extensions, and external perimeter footing drains. The truth is that most builders fail to follow these waterproofing techniques and leave out one or more of these essential waterproofing systems. While grading, upgrading gutters, and downspout extensions will reduce the amount of ground water entering the crawlspace, it is often impractical that these steps alone will completely prevent water from leaking into the crawlspace. An external footing drain is impractical and costly to install due to porches, decks, pipes, garages, sidewalks, landscaping, etc. Mostly all problems in a crawlspace can be traced back to some type of water or moisture intrusion into the crawlspace. Wood rot, Mold, Termites, and Musty odors are all symptoms of a wet crawlspace. 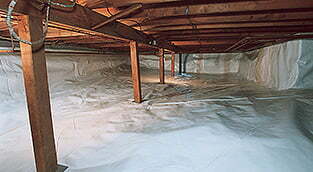 A wet crawl space will also add excessive amounts of unwanted water vapor or moisture to your home every day. Also, your home will NOT pass a home inspection with water in your crawlspace. Warner Brothers Foundation has the expertise and professionalism to help you solve your crawlspace water problem and create a healthier environment for your family. When we inspect your crawl space, we look for any sign that could indicate a water problem whether it is structural, mechanical or environmental. Give us a call today to schedule your Free Inspection.